In Star Wars: The Last Jedi, there are several scenes of the Resistance in a base and aboard a cruiser. One character we see frequently is Lt. Connix, played by Billie Lourd. A few times during the movie, a much older woman Resistance officer is seen near Lt. Connix. She is thin with a fairly sharp nose and a relatively weak chin. 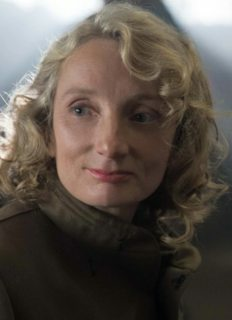 I am not getting her confused with Laura Dern as Vice Admiral Holdo. I have searched for images to show this character and I have yet to find any. Does anyone know who the character and/or actress is? Just discovered the answer in the answer to another question (Who and what is the Rebellion left with at the end of The Last Jedi?). The character is Commander Larma D'Acy played by Amanda Lawrence. Somehow when I found Amanda Lawrence's name in IMDB and did an image search, the images I found didn't look right. Not the answer you're looking for? Browse other questions tagged star-wars character-identification the-last-jedi or ask your own question. Who is this blue skinned character? Who is this purple-skinned character? Who is this goblin like character in the Phantom Menace? Who is this Voyager character? Who is this DC comic book character? Who felt this character in The Last Jedi dying?